Brewpub taps into flourishing Fruit Market. A contemporary brewpub is coming to the Fruit Market as the latest exciting destination venue in Hull’s urban village. 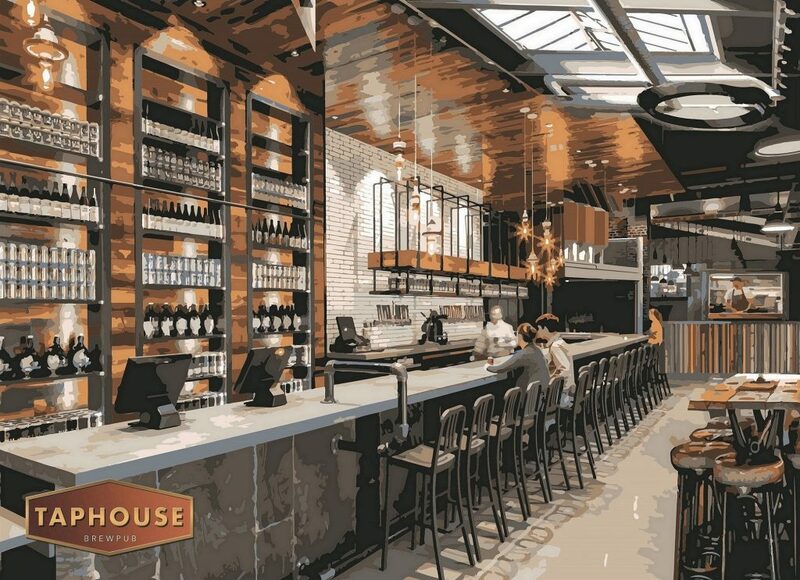 The Taphouse Brewpub will combine a working brewery with a high-quality bar offering an ever-changing choice of more than 30 draught real ales, craft lagers and ciders, as well as an extensive range of bottled and canned beers, quality wines and artisan spirits. The venue will stage a series of drinks festivals and also bring an innovative approach to its food offering. During the week the menu will focus on platters while, at the weekend, street food operators will bring their own unique tastes to the venue’s kitchen. The Taphouse Brewpub will also host a regular entertainment programme featuring music and spoken word performances, with an emphasis on supporting local artists and contributing to the Fruit Market’s unique cultural vibe. It will also have a dedicated function room which will be available for corporate and social events, product launches, private parties and wedding receptions. The opening capitalises on the growing popularity of brewpubs that offer discerning drinkers a wide selection of craft beers brewed on the premises in a high-quality environment. The new business has grown out of one of the waterside community’s pioneering ventures, the Yorkshire Brewing Company micro-brewery, which has been hand-crafting quality beers in Humber Street in the heart of the Fruit Market for more than six years. Yorkshire Brewing Company owner Guy Falkingham has joined forces with respected local licensee Lee Kirman to develop the Taphouse Brewpub concept and the pair are investing more than £150,000 to turn their exciting vision into reality. Work is well under way transforming Yorkshire Brewing Company’s premises in Humber Street to create the new venue and breathe new life into yet another of the Fruit Market’s former fruit and veg warehouses. The Taphouse Brewpub will have a stripped-back industrial look and feel, with original features conserved, revealed and restored, including exposed beams. The venue is due to open in December, creating up to 12 full and part-time jobs. The concept is inspired by destination brewpubs in major UK cities and abroad such as Howling Hops and The Bohemia in London, The Gas Works Brew Bar in Manchester, and Warpigs brewpub in Copenhagen, Denmark. Mr Falkingham, who has extensive experience of brewing and festival and events organisation, said: “It’s been a long-held ambition to create a venue like this and I’ve been talking with Lee about it for more than a year. Now it’s all coming together. “People love being where products they enjoy are made. Our customers will be able to come here and taste the beer that we’ve brewed, while watching the brewers at work, in a relaxed, welcoming environment. It will be an all-round, authentic experience. “They’ll also have the opportunity to taste beers and other drinks that they don’t usually have access to, because we’ll bring in artisan drinks from far and wide. Mr Kirman co-owns the successful Minerva pub and Humber Street Distillery Co. gin bar in the Fruit Market with his partner Charlotte Bailey and brings a wealth of experience running licensed premises to the partnership. He said: “My expertise is on the retail side and Guy’s is in brewing, so we think it works really well to bring the two together. “We’re already part of the Fruit Market community, so we know how special it is and we want to create a place that reflects its unique character and complements the other venues in the area. The new venue will have 4,000 sq ft of space, including a mezzanine level, with the floorspace split between the bar and the production area. It will have a welcoming, glazed bi-fold entrance on Humber Street, with the brewery illuminated and on view from Pier Street, making it a feature of the Fruit Market. The Taphouse Brewpub is the latest new business to be announced as joining the ever-evolving Fruit Market, which has been transformed from a near-derelict area into a flourishing commercial and cultural community. The regeneration of the area features independent creative businesses, shops, galleries and restaurants, with a high-quality residential development also taking shape. Mr Falkingham added: “Both of our businesses have been an integral part of the Fruit Market for several years and we’ve grown with the area. “We feel privileged to be able to create this venue in such an atmospheric waterfront location. We think it’s the best place in the city and we’re very excited about how the area is moving forward. The reinvention of the Fruit Market is being driven forward by Wykeland Beal, the regeneration company formed by commercial developer Wykeland Group and housebuilder Beal Homes, as part of the Fruit Market LLP joint venture with Hull City Council. The Fruit Market LLP has invested £140,000 to completely refurbish, restore and expand the building prior to works to fit out of the Taphouse Brewpub. Tom Watson, Development Surveyor for Wykeland, speaking on behalf of Wykeland Beal, said: “We’re delighted to see another Humber Street building saved for future generations. We’ve worked very closely with Guy and Lee to support their vision to create a venue unlike anything else in the region. “We’re especially pleased to have been able to help one of the Fruit Market’s long-established business to grow and evolve into an exciting, high-quality new venue while remaining true to its roots as an independent craft brewery. Councillor Daren Hale, Hull City Council’s Portfolio Holder for Economic Investment and Regeneration, said: “This exciting venture adds to the eclectic mix and vibrant offer of Humber Street. For more information about the Tap House go to www.taphousehull.co.uk or follow the venue on Twitter, Facebook and Instagram at @TaphouseHull. Be the first to comment on "Brewpub taps into flourishing Fruit Market."